Security is how you protect what you have from the outside world. But sometimes security is not just an option. It is an obligation. When it comes to new renters, you should always be sure to change the locks. This works to protect the tenant, the property, and even the landlord. There are legal risks to neglecting security, and there are even more general concerns of how an unchanged lock threatens a property. But once you understand the issues, and the best practices for changing and maintaining locks, you will know why all locks should be changed at tenant turnover. Most often, there is no legal onus on the part of the property manager or owner to change the locks at the point of tenant turnover. However, this does not mean that a landlord has “no responsibility” when it comes to security. If there were to be a burglary, the case could be made that the property owner is responsible for paying for most, if not all, damages, including the tenant’s damaged or stolen property. In order to avoid issues with paying out for all damages, it is important to stipulate culpability in the lease agreement. However, even with that, there are still issues that can arise with ‘due care’. If a tenant can prove that negligence on the part of the landlord, a number of financial penalties can begin to add up. One of the easiest ways to protect yourself from the possibility of these accusations is to take security seriously. If a case of security negligence is being heaped on you, failing to change the locks from the previous tenant could be pretty damning evidence. There are many risks involved with failing to change the locks at tenant turnover. Navigating these concerns can be one of the difficulties of being a landlord. The most obvious threat is the previous renter still having access to the new tenant’s home. This is a problem for not only the new tenant but also for the owner. It opens the property up to damages and theft. Another concern is not knowing how many people have a key. Keys can be duplicated at any hardware store (even with a ‘do not duplicate’ stamp). Once you give out a key, there is very little you can do to find out who else has access. Then expand this concern through the course of several different tenants. They may have made a copy for their significant other or given a neighbor a key so that they could take in the mail. And even when you get the key back, there is no way to know that you have all the keys. For lock changes, there are two main options. You can rekey the lock or replace the hardware fully. Rekeying is the faster and cheaper method of changing the lock because you are only removing and replacing the pins inside the lock cylinder. When you change the entire lock, the cost rises exponentially, especially if you are purchasing a high-security lock (and you should be). High-security locks will have higher metal content, so they hold up better to violent entry attacks. They will also have security pins to resist against lock bumping and lock picking. Due to the issues with key control, there is also the option of purchasing a lock with a patented keyway. Patented keys cannot be duplicated unless the registered owner approaches a vendor who is licensed through the company that manufactures the lock. Though there are patent-breaker keys available on the Internet, using a patented keyway lock does significantly reduce the chances of unauthorized duplication. A patented keyway will also be much harder to bump open. 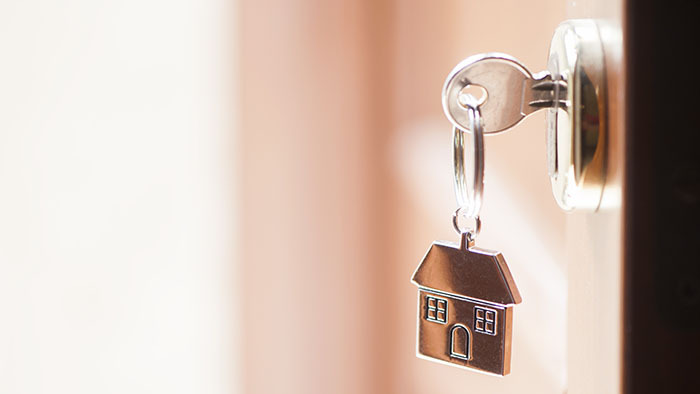 Although there may be no law that requires a landlord to change the locks from tenant to tenant, there are certain repercussions. A lock change is one of the simplest ways to demonstrate that you have made an effort to protect your tenant. If you don’t change the locks, you open the property and the tenant up to many risks. Without changing the locks, you don’t know who has the keys. For easy lock changes, you can rekey the locks instead of replacing everything. Make sure that you are using high-security products, which truly offer the home some protection. With the use of patented keyways, you can also reduce the risks of unauthorized key duplication. Taking security seriously protects tenants, property, and prevents damaging lawsuits. Don’t wait to change your locks at the point to tenant turnover.